Raclette is the name of a type of semi-hard cheese—but it is also a social dish common in France and Switzerland. In a raclette grill, the cheese is heated and then scraped off (racler, in French) onto bread. 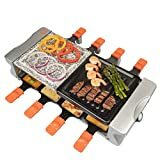 The novelty of a raclette grill is that, instead of one person cooking for the whole family, the raclette grill allows the whole family to cook together. The raclette grill consists of two racks, one above the other, and a heating element in between them. On the lower rack, you put small pans (called “coupelles”) containing slices of cheese. On the top rack, you can put slices of meat, fish, or vegetables. The heat of the grill melts the cheese, and, at the same time, cooks the food on top. You can then pour the melted cheese onto bread or the vegetables that you're cooking. The fun of it is that everyone prepares their own meal, at the same time. But there are still different types of raclette grills. Here is a guide to some of the best raclette grills on the market. 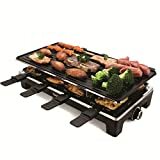 Eight-person raclette: Swissmar makes an eight-person raclette party grill (as well as a smaller, 4-person raclette grill), which is big enough for an entire family. Two-person raclette: Milliard makes a raclette rack that only accommodates two coupelles (the small, non-stick cheese pans), enough for people dining together. 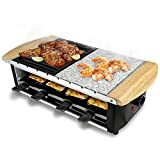 Using the adjustable temperature: People who have a raclette rack with an adjustable temperature say that at first they cook at a high temperature, and as the evening progresses, they lower the temperature, so that it cooks more slowly. Easy to clean: The Teflon surfaces, as long as they don't get scratched, will prove to be very easy to clean. 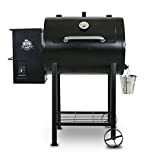 As the coating wears down, however, with use, you may find that you'll have to replace the grill top. Don't have to stand over a hot stove: Since the raclette can be placed on a dining room table, you don't have to stand over pots in a hot kitchen, cooking dinner. Everyone can cook for themselves, and improvise in the way that they want. Non-stick dishes: The dishes for heating the cheese are non-stick, teflon coated dishes. So as not to ruin the coating, it's recommended to use wooden utensils, that will not scratch. 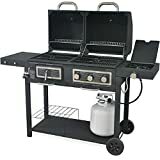 Granite stone and cast aluminum grill top: Both the Bak's Kitchen and the Swissmar offer a grill top made from teflon coated, cast aluminum, or stone. For the teflon-coated grill, use wooden utensils; for the stone grill, there are special stone spatulas. Can be used for making crepes as well: The grill top can be inverted, giving you a flat surface upon which to make crepes. Half stone/Half-aluminum: The VonShef raclette grill plate can be made half-stone, half-aluminum. 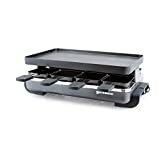 Exchangeable Grill Plates: Von Shef also makes a raclette that has a special grill plate for preparing crepes, fajitas, and more, as well as the standard stone and aluminum grill plates. Variable heat settings: Some raclette grills have an adjustable heat, while some just have an off/on switch. There are more possibilities and variations possible if you get the version with variable heat settings. Recipe books: The Swissmar comes with a recipe book, to give you some ideas of the versatility of a raclette grill. Swissmar—is a European-style cookware company with its headquarters in Richmond Hill, Ontario and a warehouse in Niagara Falls, New York. The original company was founded in 1983 in Manitoba. In 1985, they started importing the raclette grill from Switzerland, and then started manufacturing their own in 1999. They later modified the design by making it with a cast iron grill top. VonShef—are makers of bakeware and cookware, as well as food storage and serving products. They make a wide range of grinders, mixers and blenders, as well as ovens, fryers, grills and other utensils and gadgets. They make raclette grills in various forms and geometries. Milliard—started in 2009 as a family business selling candies, but they presently sell a wide range of products: for the kitchen, the bedroom, the pool, patio and outdoors, and more. 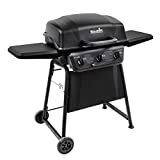 In their wide assortment of products, they also sell a raclette grill for two diners. Baks Kitchen—are makers of an electric raclette party grill with a natural stone grill as well. Their grill also accommodates up to eight non-stick dishes. They also provide two wooden spatulas.